In the premium TV market, the share of OLED TVs is steadily increasing, and the price gap with LCD is gradually decreasing. As a result, LCD TV (QD-LCD TV) companies using quantum dot technology are sluggish in the premium TV market. OLED TV uses white OLED and OLED panel with color filter (hereafter referred to as WRGB OLED), which is mass-produced only by LG Display. Samsung Display is known to actively develop blue OLED + QDCF (blue OLED), which is one of the technologies to compete with WRGB OLED in the premium TV market. UBI Research predicted that Samsung Display would implement blue OLED + QDCF with top emission method and it would be more advantageous to implement 8K and BT 2020 than WRGB in its ‘2018 OLED Material Industry Report’ published on April 18. 8K and BT2020 are to be adopted for the premium TVs. 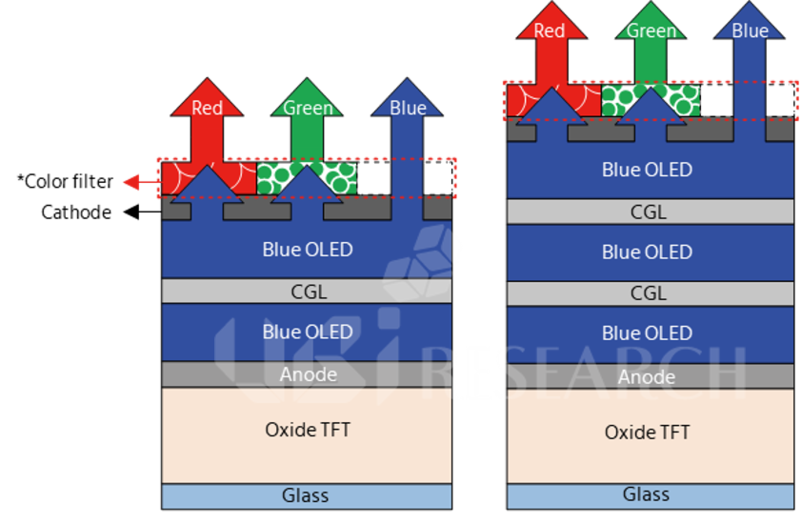 Also, the development of blue materials is expected to be aggressively progressed according to Samsung Display’s development of blue OLED. The blue material currently used in OLED is a fluorescent material that is insufficient in the efficiency and lifetime than phosphorescent material used in red and green. Blue phosphorescent materials have been developed continuously but they have not been applied to mass production due to the scarcity of materials and technical barriers. Therefore, blue fluorescent materials are stacked two or more times to improve efficiency and lifetime for large area OLED, and blue OLED is expected to use more than 2 stack structure. With this trend, the market for blue emitting materials is expected to continue to grow. In 2017, blue materials (host and dopant) formed market of US$ 70 million. 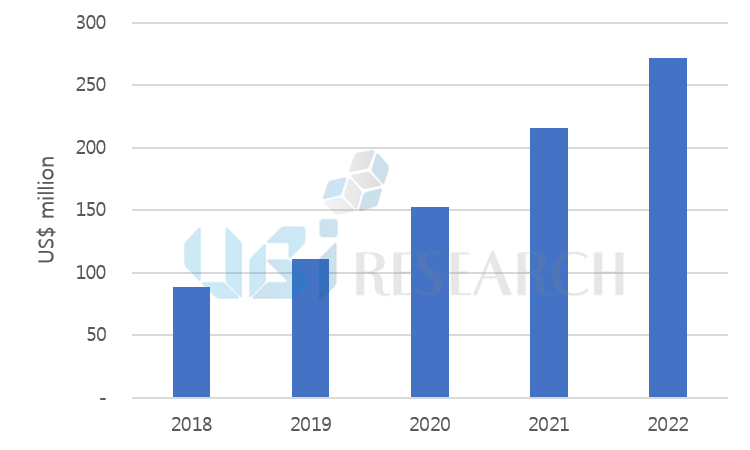 According to the 2018 AMOLED emitting material market track published by UBI Research, blue material is expected to grow at an average annual rate of 32% by 2022 and reach US $ 272 million sales.